This is one of those model where I did not really plan to build it. I actually had an old SuperScale decal sheet (MicroScale back then) that provided the exact same sets of markings that were found in this new Italeri kit. So, the markings provided in the kit were not new to me. 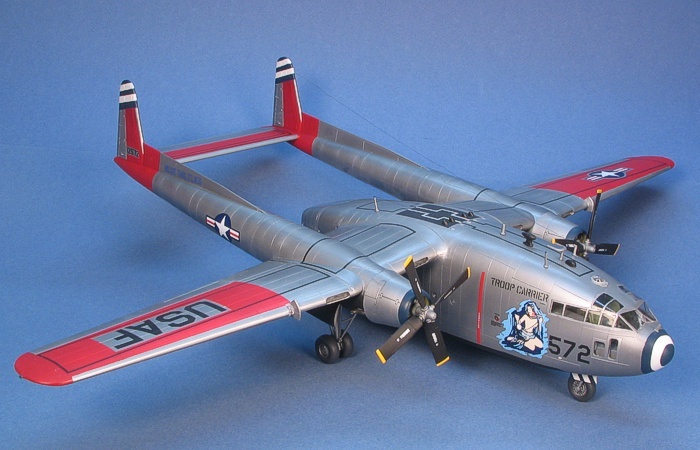 But, to use the old SuperScale sheet would have meant doing some conversion work on a C-119G kit. With this new kit, now I possessed a kit that would built these markings right from the box without any modifications. 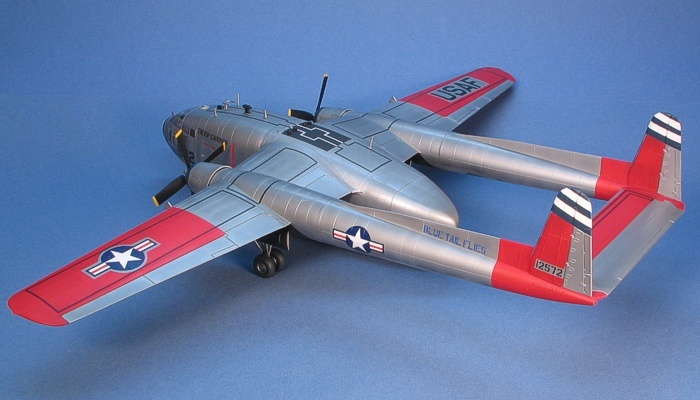 The kit is an updated version of the long available C-119G kit from Testors and Italeri. They made some mold modifications to backdate the kit to a C-119C standard. The changes to the kit include the following. 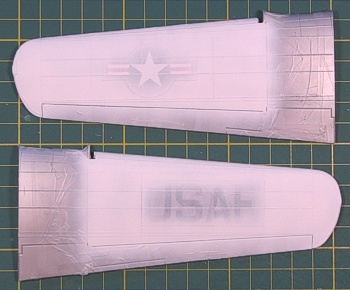 Italeri changed the molds to update the tail booms, removing the ventral strakes under the tail. This is probably the most noticeable airframe change on the C-119C as compared to the C-119G. They then included additional pieces to provide the single-tire nose landing gear, split sets of nose wheel well doors, and earlier style engine cowls with alternate engine exhausts. The original kit pieces for these additions were left in the kit, so an updated C-119 with the dual nose wheel can be made from the kit. Two other additional pieces are a set of truck ramps for the cargo door. And, since this is a cargo aircraft, they also provided a complete 1/72nd scale truck kit to include inside the cargo bay. This is a nice touch, but not really necessary unless you plan to open the cargo bay (which I did not plan to do). 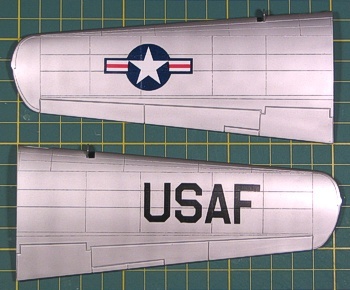 No other changes were made to the moldings, so the kit is still raised panel lines like the older C-119G kit. The fit is above average, which is good on a model that will get a natural metal finish, but there still is need for a little filler to completely hide some of the seams. Like most aircraft models, the construction starts with the cockpit. 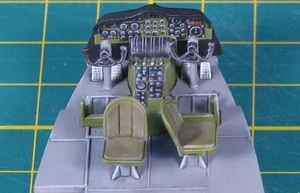 The cockpit has raised details and is rather complete. The only issue in the cockpit is that the map table on the back wall is molded to sit too high. 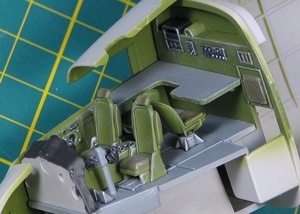 If placed were the locators are molded, the side of the table would cut through the middle of the side cockpit windows. I removed some of the rear wall details and mounted the map table lower so that its top surface was just under the windows. This looked better and in scale placed the table 36 inches off the cockpit floor. This is about the right height for most tables, so I felt confident that this was the right way to go. 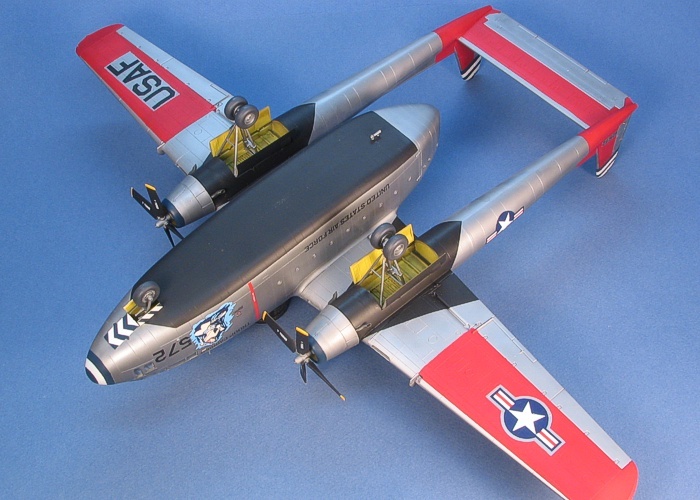 When I built this kit before (as a C-119G), I made the cockpit D.Gull Gray (F.S.36231) since that is the cockpit color of most modern (and semi-modern) US aircraft. The booklet that came with this kit had some color interior images that showed the cockpit was more like WWII aircraft with interior green as it's basic color. Who am I to argue with color photos? So, I painted the interior in WWII fashion with interior green walls and a gray (D.Gull) floor. Even the instrument panel was green in the photos, so I made mine green as well, with black instrumentation. I was not planning to open the rear cargo doors or forward crew entry door, so I left the cargo bay interior unfinished. I figured (and turned out to be correct) that the view through the portholes on the fuselage sides would not be enough to know whether the interior was finished or not. Painting the outside of the model was interspersed with construction. I was not looking forward to having to mask off all the tiny round portholes on the fuselage sides. Then a thought occurred to me. Maybe I should paint the fuselage sides before I install the windows, indeed, before I even assemble the fuselage. Then, I can install the windows into a fully painted section of the fuselage and mask off the whole side of the model instead of just the windows. This is the route I took and it worked great. I painted the fuselage sides, the specific panels where windows were located, then I installed the windows. Once this was done, I masked off the entire panels where windows were found and constructed the fuselage. I then sanded and sealed the fuselage seams and painted the remaining portions. This approach worked like a charm and saved me significant time having to mask each of the tiny round windows, one at a time. Of course, this process was contingent on the fact that the windows fit in the intended holes in the fuselage, which fortunately is true (for the most part). I next assembled the tail booms with the center wing section and horizontal tail. 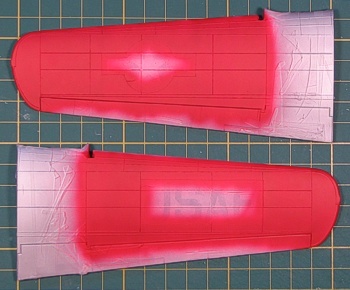 Addressing all the seams, I then painted the whole tail area prior to attaching the wings or the fuselage. I also assembled the outer wing sections and painted them, too. After all the painting, I then attached the wings to the tail assembly, addressed the seams, and touched-up the airframe painting. This modular approach to painting and construction worked well for the complex shape of the C-119. The painting of this model is done exclusively in Testor's Model Master enamels and Metalizers. I considered trying out Alclad II for the first time on this model, but I had a bottle break when shaking up the Alclad and spew paint over half my work area. This soured me to the idea of using Alclad and I stuck to my tried and true Model Master Metalizers for the painting. I used "Steel" Metalizer for the entire airframe. After gloss coating the model and decaling, I applied highlights with more "Steel" Metalizer. The clear coats had marginally shifted the tone of the original "Steel" coating so that the highlights were subtle. Pictures of C-119s I have seen showed that they did not have too varied a look to all the airframe panels, so I kept it minimal on the model. The finish is far from perfect. This really is a "two-foot model". I was just building it for fun, not competition. The nice part about pictures is that I can control the angle, lighting, and closeness so as not to highlight the imperfection in the painted finish. The Arctic Red panels were primed using Insignia White, then painted in Insignia Red. To do the metal surrounds on the wing markings, I first painted the whole wing in metal. Then I applied the USAF and national insignia decals and masked over them with Parafilm-M, leaving a metal border around the markings. Only after this did I apply the white primer color and the red panel color. This approach gave the markings a better feeling that the surround areas were just the unpainted metal. I have seen decal manufactures provide silver printing on the decals for the surround areas, and they always come off looking like silver paint when compared to the nice Metalizer found on the rest of the model. I masked and painted all the unit markings in blue and white. I did not trust the decals to conform to the tail top and nose contours. Besides, the nose decal for the "target" seemed small when I compared it to reference images. Painting it allowed me to re-size it more closely to the size of the "target" on the noses of the actual aircraft. I then masked and painted the black square on the top of the fuselage along with the black of the engine exhaust areas. The kit decal sheet is reasonably complete. There is not much in the way of airframe data, but at least all the wing walkway stripes are provided. There are four aircraft present -- three US aircraft from the 403rd TCG and one French. The French aircraft started with the 403rd TCG, so it could be built as a US machine simply by changing the national insignia. The French and two of the US aircraft have nose art. The decal printing quality is not too badly done. 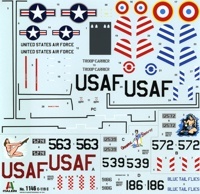 On close scrutiny, I found the kit decals to be no better or worse than the SuperScale decal sheet I have had squirreled away for over a decade for the same aircraft. This includes the quality of the nose art decals. 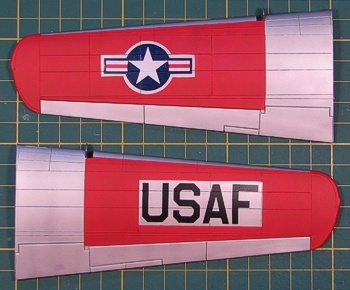 I picked and chose between the kit and SuperScale decal sheets as I applied the decals. Some decals were printed better on the kit sheet, while others were printed better by SuperScale. I decided I liked the SuperScale version of the nose art just a tiny bit more than the kit version. To separate the tail numbers from the silver backings, I printed up my own custom decals for the numbers. People addicted to true authenticity in modeling should not read this next paragraph. I took some artistic license on the model. I marked the aircraft so it is from the 64th TCS (with blue trim) but applied nose art from a 63rd TCS aircraft (which wore red trim). I liked the look of the blue trim on the aircraft better than the red, and I really wanted to do this specific art work which I felt accented the blue trim markings nicely. This art work really belongs on a red trimmed aircraft, but I felt the red trim was lost in the arctic red panels. I accept whatever judgement is handed down from the authenticity police. As part of the painting, I slowly got the entire airframe assembled. It was as the model was finally assembled that I realized I was too quick to assemble the fuselage. I had placed no weight in the nose! I refused to build a "tail-sitter" and endeavoured to fix the problem. Fortunately, I had not attached the rear clamshell cargo doors, so I had access to the cargo bay. To get the model up off its painted finish, I started with the landing gear. I painted the struts and wheel hubs in Steel Metalizer. I painted the rubber tires in Engine Gray (F.S.36076). The kit landing gear is nicely done and plugs right into the wheel wells. The single wheel nose strut (part of the C-119C specific parts) caused no problems. One of the biggest changes was the inclusion of a DF "football" antenna on the upper fuselage. 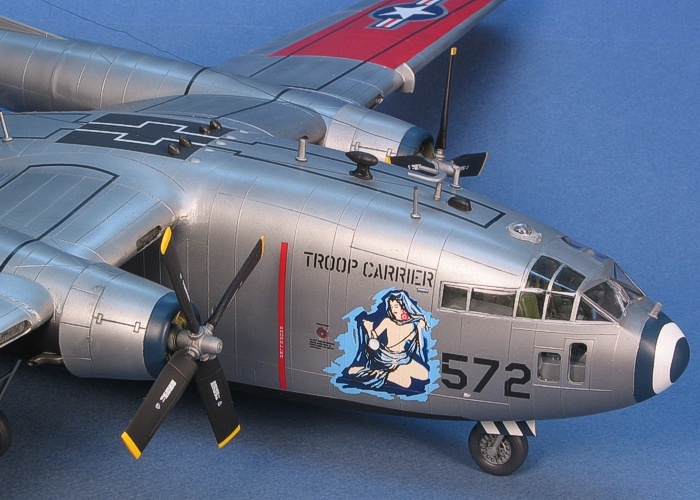 I obtained this from a 1/72nd scale B-24 kit. I filed down one of the molded antenna humps and replaced it with the scavenged "football" antenna. Another change is the inclusion of a blade antenna in front of the windscreen on the upper nose. I scratch-built this from 0.015" strip styrene and attached it using a fine brass wire pin. The C-119G has two pitot masts (I guess that is what they are) on the nose that look like cat's whiskers. C-119Cs do not get these masts. So, I used these two masts provided in the kit to rebuild different masts for the upper fuselage so the line antennae would go in the right places. The line antennae are hair from my wife. I tried using fine wire and stretched sprue, but neither would work. The real culprit was my aging super glue that took too long to set up. The wire was too springy and would not stay tight until the glue set up. The stretched sprue was too brittle and broke before the glue set up. Since my wife had recently cut her hair short, I gave in that maybe I just would not put line antennae on this model. Then, searching the bedroom, I found a spot that had not been cleaned recently and in it was some long hair. Human hair is tough and resists breaking, so I could get the line tight and keep it tight until the glue finally set up. Then, I just painted the lines black with a small paint brush. The revised antennae make this C-119C look a little different -- OK, a very little. But, this way I will have that much more to make it look different when (if) I build a C-119G model which will also be metal with red visibility panels. As I wrote at the top of this posting, this was a project that "just happened". Along the way my interest in the project started to slack off. I needed to push a little to get the project done. It is far from being competition piece quality, but then that is not what I was looking to create when I started it. While not Tamiya or Hasegawa quality, the Testor/Italeri C-119 kits are all very nice kits. I would recommend any of them as easy hobby enjoyment.